Happy Thanksgiving to the SimpleCert community! You will remember in our Sept 14 blog that this fall has seen many updates to how users can design and complete certificate templates from within the Build Module of SimpleCert. Please do be sure to read thru the past blogs to stay up to stay informed of these improvements – and we’re not done with updates just yet! Our thanks as always go to many of you who have sent us your ideas and suggestions, on how to make SimpleCert work better for you. One great update is the ability for you to contact SimpleCert support from directly within the tool itself. Let’s say for example you are building a Diploma Certificate and need help with a merge variable item; or perhaps as part of your certificate template you have an unusual design that you need help with. Instead of exiting the tool and going back to the website to contact support, it’s now easy to click on the “Contact Support” link directly on the top right side of the tool. Regardless of where you are in the tool, the “Contact Support“ link will always be right there and available to you. In the end our goal is to make the creation of your certificate template, and the distribution of your certificates, as easy as possible. Whether you are taking a blank certificate and using that as the basis for your certificate template, or utilizing one of the many templates that are automatically available for you from within the tool, we understand you have better things to do than to spend hours upon hours managing your certificate distribution program! So use SimpleCert, keep the feedback coming, and get on with more important items in your life! Time for Updates at SimpleCert! It’s time for updates at SimpleCert! Like many places, it’s a truth here that after a busy spring season, our brains turn to mush and we have no choice but to find creative ways to spend time at the beach, or the mountains, or at a concert… anywhere to refill the creative coffers and rest our weary heads. Preferably with a tasty beverage in hand. Coming out of Labor Day and with summer now behind us, our team is rested, refreshed, and focused exclusively on ways to make SimpleCert an even better tool for your certificate creation needs. For those of you that manage multiple certificate templates as a part of your subscription, you know that it’s an easy process to add additional Cert Sets to your account. Now there’s an easy way to copy an existing certificate as a template when adding a new Certificate Template to your account! From within the Build Module, simply purchase a new Cert set for your account – and then just click on the “Duplicate” icon that’s on the top left corner of your already existing Cert Set. Presto! A new Certificate Template that’s a copy of your existing Cert Set, that you can now easily customize. We realize that for many of you who do manage multiple certificate programs, being able to utilize an existing design when creating a new template is a great way to save time and energy. No more starting with a blank Certificate! If you look closely in the Certificate builder when you are clicking on a text or data field, you’ll notice our next feature enhancement on the top right corner of the building area: A button that says when you hover over it: “Align Center”. With this new feature, when you are adding or editing a field on your certificate and click this button, that field will automatically be aligned in the center of your certificate. BAM! Go ahead and file this one under “Why didn’t you think of this before?”, you won’t hurt our feelings. But we hope it helps as you continue to build your certificate masterpieces. Be sure to check back here again soon for further updates – there are several others in the works that we will be releasing soon. And don’t forget if you ever need help building your certificate templates you can reach out to support@simplecert.co at any point. And remember you can also check out our tutorials and how-too videos on our YouTube channel at any point for great tips and pointers. You can now add attachments to your certificate template emails! Regular users of SimpleCert know that an important piece of your Certificate Template – or Cert Set – is the notification email that is sent out to recipients. It’s thru this email that you notify your award recipients they have received a certificate, as well as provide instructions for how to access and even print their custom certificate(s). The notification email can also serve as an effective marketing tool within your Certificate Template as they can be customized with text, fonts, and even pictures and logos to better mirror your marketing style. As part of a recent upgrade, we are excited to highlight a great feature enhancement that has now been added to the notification email – the ability to upload and add attachments! Now, the notification email can be an even more effective element of your Cert Set. Let’s say for instance that as part of a certificate awards program for a class, you are also needing to distribute out class notes. Instead of having to mass email the notes out separately, you can simply just attached those notes to the notification email that is a part of that Certificate Template. Boom! As you use SimpleCert, we encourage you to not look at the notification email as just the way to distribute certificates. We encourage you to look at the notification email as a free and powerful element of your Certificate Template. We’re hopeful that by adding the ability to use attachments as a part of this email, you’ll be able to maximize the effectiveness of this tool even more. As always, a heartfelt shout out to all of you who have provided feedback and suggestions for how SimpleCert can be improved. We’d be lost without you! And remember, if we can help you with anything – creating your Certificate Template, solving a problem or even offering advice, do not hesitate to reach out to support@simplecert.co (Please note any advice given shall be exclusively related to and solely pertaining to certificates – award certificates, diploma certificates, blank certificates, etc. You really should only trust us to provide council on that!). John Oliver needs a Certificate Tool! We are huge fans of John Oliver and his hit show “Last Week Tonight”, and so we couldn’t help but laugh even harder during the June 12th episode when John Oliver announced his staff had created 2 certificates for fans who could download them. After downloading the certificates ourselves we feel it our moral and (ahem) professional duty to politely point out that John Oliver needs a Certificate Tool for his certification needs! Instead of handwriting a person’s name on a certificate, think of how good it will look to have each name printed out, and a part of the certificate! Imagine being able to automatically email certificates instead of printing each one of them. Imagine giving your recipients the ability to store and access their certificate(s) through an online portal… for free! We think the producers of last Week Tonight would love to see who accessed their certificate(s) and who they issued a certificate to (maybe John Oliver will want to send out more Elf Spotting certifications in the future, who knows.. work with us here!) Whether is certificates of completion, or elf spotting certificates, SimpleCert has you covered! All kidding aside, our point is this – WHEN you have a need to create and distribute certificates for whatever purpose, look no further than SimpleCert. 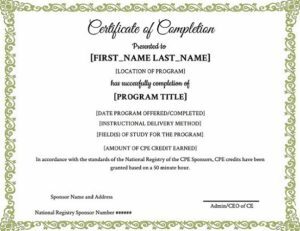 SimpleCert gives you the ability to create and distribute professional certificates – all within an efficient and easy to use program. And don’t forget you can always reach out to support@simplecert.co with any questions you may have – we’re even happy to help you with creating your certificate. If anyone from Last Week Tonight happens to read this, we’d LOVE to help create an even better Elf Spotting certificate! Bring it! Here’s a Pro Tip: We’ll build your Cert Set for you! Here at SimpleCert HQ, support is continually focused on providing the help and guidance that you need. For some that may be digging into an excel file containing a recipient list to uncover incorrect email addresses. For others, it may be helping with a stubborn logo or graphic that a user wants to place on a certificate. Regardless of the need, Support is here to help. Lately we’ve noticed several instances where users have even requested help in the building of a complete Cert Set. And while SimpleCert empowers you to create amazing certificate(s) from within your account, let me again restate the mission of SimpleCert Support: We are dedicated to assist and help you in your use of SimpleCert, in any way. So at the risk of soliciting eye rolls from the support cubicles, I’m making public knowledge what some of you have already figured out: SimpleCert support will build your cert set for you! All you need is an account, and then simply send an email to support@simplecert.co. If you already have a certificate that you want to use in SimpleCert, be sure to attach that to your email. Or if you have ideas for how you want your certificate to look, just attach any drawings or artwork that you have. Also remember that since a Cert Set consists of BOTH a certificate and the notification email that you will send to your recipients, be sure to include any language that you want Support to add to that notification email. Give us a day or so, and once we’ve gotten back to you just log into your account and voila! A perfect certificate, ready for you to use.